Short Info: As we know the Union Public Service Commission has successfully filled up the vacant seats for IAS. There are 892 vacancies in this recruitment. UPSC has successfully conducted the UPSC IAS Mains examination on 28th September 2018 to 07 October 2018. Candidates who have qualified the UPSC IAS Pre-examination have appeared in mains examination. The pre-examination was conducted on 3rd June 2018 and the result was declared on 14th July 2018. Now the authority has declared the UPSC Civil Services Mains Result 2018-19. It is going to tell the candidates about their selection for further process. The candidates who have participated in the mains examination are able now to check their result. 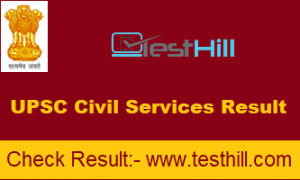 The UPSC Civil Services Result is available on the official website. You can check it from this page also. We have provided a direct link to check the result. Candidates who have participated in the Union Public Service Commission IAS Mains examination want to know about their result. Here is good news for them. The result has been declared the mains result. You are able now to know about your selection for further process of selection. They need to visit the official portal with respect to check the result. Candidates can check their roll number in the result pdf. Indian Forest Service IAS result pdf link is available on this page also. You can check your roll number in the result pdf directly by the below available link in the table. appeared candidates can check their result from this page. They need to follow below-given steps to check their result.